The Rock & Roll Hall of Fame and Museum is managed by The Rock & Roll Hall of Fame Foundation, whose founder, Ahmet Ertegun and his team began inducting artists in 1986 before it even had a home. Designed by world-renowned architect I.M. Pei, the Rock Hall covers 150,000 square feet with a combination of dynamic cantilevered spaces and bold geometric forms that are anchored by a 162-foot tower and glass pyramid. A 65,000-square-foot plaza rests at the entrance to the building, and the building has over 55,000 square feet of exhibition space, as well as rooms for administrative offices, a Museum store – the FYE Museum Store, and a vibrant café called the Rock Hall Café. The Rock & Roll Hall of Fame and Museum was opened in 1995 by Yoko Ono and Little Richard, followed by an all-star concert at the nearby Cleveland Stadium. 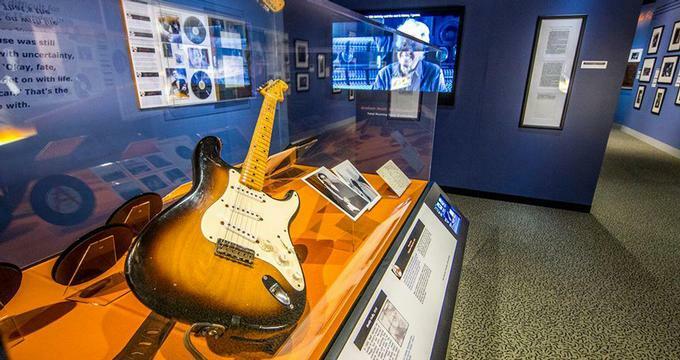 The Rock & Roll Hall of Fame Museum explores and highlights the rich history of rock and roll, while the Hall of Fame inductees is honored in a special exhibit located in a wing that ‘floats’ over Lake Erie. The Rock & Roll Hall of Fame and Museum is spread over seven levels. The Museum is entered on the first floor, which features a stage that is used for various special events and performances and events throughout the year, as well as an exhibit that focuses on contemporary artists. The Museum’s main gallery is housed in the Ahmet M. Ertegun Exhibition Hall on the lowest level of the building and includes exhibits on the roots of rock and roll ranging from folk, country, and bluegrass to gospel, and rhythm and blues. This gallery also has exhibits on cities that have had a significant impact on rock and roll such as Memphis, Liverpool, and Seattle, as well as individual artists like Jimi Hendrix, The Beatles, and The Rolling Stones. The Ahmet M. Ertegun Exhibition Hall is also home to two state-of-the-art theaters, one of which presents a film about the roots of rock and roll, and the other which shows a variety of films on different music-based subjects. The second floor allows visitors to explore several interactive kiosks that showcase ‘the songs that shaped rock and roll’ and various one-hit wonders, as well as exhibits on the evolution of audio technology and artifact-filled displays about Sam Phillips, Les Paul and Alan Freed. The third floor of the building is home to the Hall of Fame section of the museum and includes exhibits that feature inductees’ artifacts, a wall covered with inductees' signatures, and a theater showing filmed musical highlights from all of the inductees. The fourth level features the state-of-the-art 3-D Foster Theater that is used for special events and programs. The upper two levels of The Rock & Roll Hall of Fame and Museum feature temporary exhibits on renowned artists such as John Lennon, Elvis Presley, U2, and Bruce Springsteen. The Rock & Roll Hall of Fame and Museum offers a variety of educational programs and workshops for learners and music-lovers of all ages. Designed for everyone from toddlers to adults and among the most celebrated and award-winning programs in the country, classes and workshops aim to develop a deeper understanding of how rock and roll have influenced the world around us. The Rock & Roll Hall of Fame and Museum is located at 1100 E 9th Street in Cleveland, Ohio and is open daily from 10: 00 am to 5:30 pm with extended hours on Wednesdays until 9:00 pm. The FYE Museum Store sells an array of official Rock Hall and exhibit merchandise, clothing, posters, vinyl, CDs, DVDs, books, and Rock Hall gift certificates. The Rock Hall Café is situated on the third floor of the Museum and serves light meals, snacks, decadent desserts and beverages against beautiful bird's-eye views of the Museum’s lower levels.